Hundreds of protesters have rallied to support Colin Kaepernick, the controversial NFL player who staged protests during the US national anthem. Kaepernick stirred controversy last year for sitting or kneeling during the anthem, in protest against the treatment of black Americans. The quarterback has not been signed for any team next season, which begins in early September. Supporters claim he is being pushed out because of his political action. However, NBC sports commentator Bob Costas told CNN: "The idea that Colin Kaepernick can't play for some team, and that he isn't among the 50 or 60 best quarterbacks who could play in the NFL, is ridiculous." But he added he believed team owners were making their own decisions, rather than following any edict from the NFL. Kaepernick's protest was hugely divisive across the US last year, taking place after a series of deaths at the hands of armed police. But critics claimed that Kaepernick's actions were disrespectful to the American flag and to members of the armed forces which defend it. Angry fans posted videos of Kaepernick jerseys burning, and the sportsman said he had received death threats. The rally took place outside the headquarters of America's National Football League (NFL) in New York City. Ahead of the demonstration, the National Association for the Advancement of Colored People (NAACP) sent a letter to the NFL on the issue, saying team owners were avoiding signing the player because of his protest. 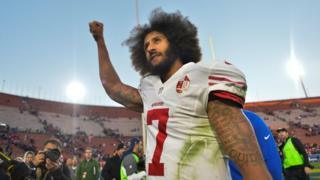 "As the NFL season quickly approaches, Mr Kaepernick has spent an unprecedented amount of time as a free agent, and it is becoming increasingly apparent that this is no sheer coincidence," the NAACP said. At the rally outside NFL buildings in New York City, several speakers said the issue was more important than securing a contract for Kaepernick, while others called for a boycott of the NFL. Tamika Mallory, Co-Chair of The Women's March on Washington, said: "Don't let them tell you that we are out here for one man. "Even Colin Kaepernick will tell you that he didn't just knee for himself or for his family, he kneed for all of us." On the other side of the road from his supporters, a small handful of counter-protesters had gathered, one of whom waved a sign reading "Colin the Commie". Many Kaepernick supporters raised their fists in a salute made famous by US sprinter Tommie Smith at the 1968 Olympics. On Monday night, more than a dozen players from the Cleveland Browns team knelt in prayer before a pre-season game, in imitation of Kaepernick's protest. One white player who joined the protest, Seth DeValve, told the AFP news agency he had decided to take part after the clashes between white supremacists and counter-protesters in Charlottesville. DeValve, who is married to an African-American woman, said: "I myself will be raising children that don't look like me, and I want to do my part as well - to do everything I can to raise them in a better environment than we have right now."